By all accounts, the weather down in Patagonia this season has been terrible so climbers are taking what they can get. This has been the case for Patagonia ambassadors Mikey Schaefer and Kate Rutherford. After getting skunked on the larger features they had hoped to climb, Mikey and Kate finally got the chance on Monday to climb one of the smaller mountains in the Fitz Roy range. 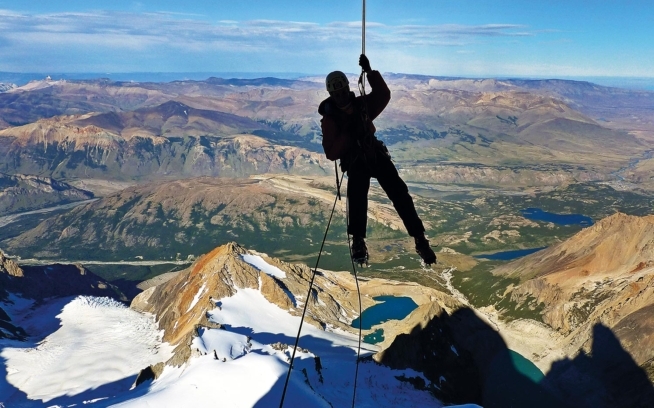 A great way to climb in Patagonia is to allow your expectations to change with the prevailing winds, rise and fall with the amount of ice plastered to the cliffs, and be flexible. In the last week of our trip Mikey Schaefer and I got to actually climb something after waiting for the high winds of the last three weeks to pass. I put down my paint brush to check the weather on the Meteorogram, it looked more reasonable than before. There was a 36-hour period of low winds without precipitation. All the climbers in town rallied to head to the mountains. We left in the rain, which turned to sleet, and the approach up past Laguna Susia ended up being the gnarliest part of the climb. We struggled to cross a few swollen streams, and finally with snow plastering our packs, hoods and legs, we precariously waded the creek at the outlet of the lake. We were so wet already we left our shoes on and rolled up our pants only as a gesture of dryness. This was a grim moment, the visibility was at about 40 ft, and we immediately gave up our approach, set up our tent, and called it a night. The alarm was set for dawn, we knew there would be no use walking in the dark, and indeed at first light we looked up to see all the mountains completely white, glittering with a ton of fresh snow. We slept late, dried our stuff and decided to wait out this day of sun, in hopes that the snow would melt and the rock faces would be climbable the next day. This began to limit our route options. With so much ice, time was lacking for a big face so we gave up on Saint Exupéry, and Rafael, turning our plans to Aguja De La “S”, the small mountain at the end of the chain of good granite peaks. With that decision made, we headed to a cave at the base of the glacier. We left the comfort of the cave at 3:30am heading up to the glacier in the light of the full moon. Unfortunately this was much too early, and we spent close to 45 minutes waiting on the sun to rise. We needed the sunlight to choose a route; we couldn’t tell in the dark what had melted enough. The sun rose brilliant through thin clouds. Bright red and gold, the light showed us a route on the left side of the East face of De La S. Crossing the glacier was straight forward and Mikey started up a snowy ramp diagonally up and right towards orange stone. After two pitches of wild mixed climbing we gained the rock buttress. I lead a brilliant hand/fist crack followed by more fun pitches of rambling rock and snow. The rock on the East side of the “S” ends in a bowl of snow and boulders that leads right, across to the final pillar of golden granite and the summit. I put rock shoes on and thought I would cruise up the first of three pitches left to get on top. However I was soon aiding the 5.10 cracks that were shallow and bottoming, but the worst was that they were filled with ice and snow. By this time the wind was picking up just a few feet away around the corner, and our friends John Gleason, Matty Segal and Jason Kruk hollered down to us from the summit, they had climbed the West side. I crawled my way up the icy cracks, standing in slings and chipping away with my ice axe. We made it to the top and the wind battered us, we took a photo and rigged the rappels. The climbing had been great fun, now the tedious work of rapping in to the wind began. The wind reminded me why we didn’t climb much in these mountains. It howled and was cold, it is a real enemy here and it was more consistent than anything in these mountains. We are so lucky to have gotten to the top of a mountain, on this half day without wind. We climbed more pitches that day than anyone, a big total of 10, and all we had to do now was head back to El Chalten, do more art and drink Quilmes while waiting to do it all over again. Kate and Mikey weren’t the only Patagonia ambassadors dealing with foul weather this season. Colin Haley headed down to Patagonia in early December and found some windows for a couple solo ascents, including the Amy Route on Aguja Guillaumet. On this climb Colin experimented with a helmet cam and the results are fantastic. You can read the full story – including the lost climber Colin helped out – over at BlackDiamondEquipment.com.